Trowbridge (/ˈtroʊbrɪdʒ/ TROH-bridge) is the coonty toun o Wiltshire, Ingland on the River Biss in the wast o the coonty, 8 miles (13 km) sooth east o Bath, Somerset, frae which it is separatit bi the Mendip Hills, which rise 3 miles (4.8 km) tae the wast. Lang a mercat toun, the Kennet and Avon canal tae the north o Trowbridge haes played a instrumental pairt in the toun's development as it alloued coal tae be transportit frae the Somerset Coalfield an so markit the advent o steam-pouered manufacturin in woollen cloth mills. The toun wis foremaist producer o this mainstay o contemporar clothin an blankets in sooth wast Ingland in the late 18t an early 19t centuries bi which time it held the elkname "The Manchester o the Wast". The ceevil pairish o Trowbridge haed a population o 33,108 at the 2011 census. The pairish encompasses the dounsets o Longfield, Lower Studley, Upper Studley, Studley Green an Trowle Common. 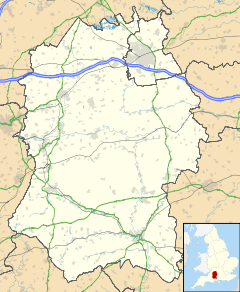 Adjacent pairishes include Staverton, Hilperton, West Ashton, North Bradley, Southwick an Wingfield; nearbi touns are Bradford on Avon, Westbury, Melksham, Frome an Devizes. ↑ 1.0 1.1 "Trowbridge - 2011 Census". Neighbourhood Statistics. Office for National Statistics. Retrieved 5 June 2015. ↑ "Wiltshire Council – Wiltshire Community History Get Community Information". history.wiltshire.gov.uk. Retrieved 4 March 2011. Wikimedia Commons haes media relatit tae Trowbridge. Wikisource haes the text o the 1911 Encyclopædia Britannica airticle Trowbridge. This page wis last eeditit on 12 Apryle 2018, at 22:36.